"For me, college was great. 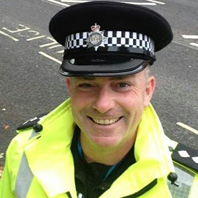 I was painfully shy at that stage and it helped me grow as a person"
Retired police officer Pete Szabo was “painfully shy” and not “particularly bookish” as a young man…yet he went on to hold some of the most senior positions in the Derbyshire force. And, looking back, he credits his early training in an entirely different field at Derby College with broadening his skills, as he “grew” to pass his police training course with the second highest mark. When he retired at the end of October, Pete, 52, had operational oversight of 680 officers and police staff, yet in the mid-1980s he worked as a laboratory technician in Belper. While Pete was with solid fuel business TI Parkray, he studied on release for a day-and-a half-a week, over four years, at Derby College. He gained his ONC and HNC engineering qualifications with passes and merits. And his time at Derby College helped lay the foundations when he decided to change career and apply for the police. Pete said: “For me, college was great. I was painfully shy at that stage and it helped me grow as a person, through meeting and learning from people from a wide range of backgrounds and different ages and cultures, and from various sections of industry like Rolls-Royce. Pete progressed through the ranks, from PC, to becoming the youngest Sergeant at the time in Derbyshire, to Inspector and Chief Inspector. At one stage he headed Learning and Development for forces across the East Midlands. He retired as Chief Inspector and Operations Manager for the Derbyshire force. Pete is currently studying for a Chartered Management Institute (CMI) Level 5 qualification and said he intends to keep on learning.